Usually right around this time each year, I notice at uptick in visits to the Amish State Guide. I attribute it to people looking for info on Amish communities with the coming of spring and summer. 88 responses to Are you visiting an Amish community this year? This is funny that this came out today, the first day of my vacation, where I plan to hit at least 3 Amish communities in Nebraska and Missouri and one old order Mennonite community in Kentucky. Up packing away at 5am today! I’m actually hoping to find some other Amish places along the way. For the last few years we have visited Ethridge Tn, and will go again in October as that is when the big Amish auction is ( 2nd Saturday in Oct). We also plan to visit Marion, Ky Amish community and also the community close to Munfordville, Ky. I get most of the information from “Amish America” along with internet sites of the cities. I would encourage anyone that has never been to an Amish settlement to go!We see something new and different each time we go. We went to Marion, KY a few weeks ago. Enjoyed driving around the area and stopping at the homes that had signs up. There aren’t any motels there, a couple B&B’s I think. For the fun of it, take the ferry to Cave in rock. LOL And now that Norma Burroughs listed two other places in Kentucky, I will try and stop by them as well. Norman, there are Old Order Mennonites in Scottsville Kentucky that you might want to see as long as you are in the general area. Thanks for info on Scottsville! And you be sure to check back in here with lots of stories and places to stop after your trip! Have a safe and relaxing trip! I just sit on the front porch and wave when they go by. Definitely going to Berlin, Ohio. When i visit my daughter in Hardin County Ky i see them but it’s not like going to Berlin, Ohio. Have made several trips to Parke County, IN. There is a growing community there. Also, plan to make at least one trip to Holmes County, Ohio and Arthur, IL — may even make a trip to Davies County, IN before the summer is over. We live less than 30 minutes from Nappanee & we love it…. honestly, our ‘other’ reason is the slower paced life style that we observe….hard working, but not always go, go, go like us! We discovered Holmes Co 2 years ago & that is now a summer get away for us each year. We found a log cabin that we rent & relax!! I just went to Bertha, MN last weekend. My daughter and I enjoyed traveling down country roads in search of home businesses (I was craving Cashew Crunch) but we were unable to locate any. I love turning off the radio and rolling down my window and driving slowly, taking it all in. I feel a peacefulness and desire to simplify. I plan to visit the Mora, MN Amish community. They have a home bake sale every Saturday. I like to stop in every few months and I’m always greeted with a friendly smile. There is several new communities near my hometown of Milaca, MN so I plan to visit and welcome them to the area as well. In addition to the Amish comminities in Central MN, I plan to meet Anne’s son, Ed and his wife Ruth in Fertile, MN. Spring has finally arrived so I imagine they’re all itching to start planting. I know I have the travel bug! In February visited the Amish community near Munfordville, KY as well as the Old Order Mennonites in Scottsville, KY. We also visited the Caneyville Christian Community in KY, while not actually Amish is made up of many former Amish or German Baptists. We just went 2 weeks ago for a short trip to Holmes County, OH. We live in VA and are only a couple of hours away from the 2 Amish communities in Charlotte Court House and Halifax (aka Nathalie), which we have also been through once already this year. On May 18th the Halifax community is holding it’s annual field day and auction at the Daniel Coblentz farm. We missed it last year when we learned about it after the date passed. My wife spoke with Mr. Coblentz this week and the community accepts consignment of items to sell from the greater community and keeps 10% to be used for their school. In addition to the auction they have lots of food for sales, although he did mention that most of the baked goods are gone by 9AM! My wife and I were looking for someone to go on a “day trip” for our anniversary on May 31st and just figured out tonight that we are only 2 hours from the largest Maryland settlement in St. Mary’s county. So, in addition to our visit next weekend (hopefully!) to Halifax county we are now planning to hit St. Mary’s at the end of the month. Chris, I am very familiar with the St. Mary’s County, MD settlement. They are centered around Charlotte Hall area. If you travel a bit farther towards Leonardtown, the Loveville area is home to Old Order Mennonite settlements. You will notice differences like black buggies instead of gray, they ride bicycles instead of scooters and some clothing differences as well. Enjoy your trip to this most beautiful part of the state … my family goes way back in that part of Maryland. Chris, Check out this link! Thanks for the info and the link! I’m not sure why we didn’t figure out that this settlement was as close to home as it is earlier. We are looking forward to a fun day trip. You’re welcome Chris. I don’t think a lot of people are aware of this settlement. We became aware years ago when some of the Amish men helped my uncle raise a tobacco barn on his farm near Bryantown. I remember my aunt making her delicious fried chicken for their lunch and saying what a joy these men were. I have cousins who have bought furniture and plants from the Amish in St. Mary’s. We were in the area back in early December and stopped at the market in Charlotte Hall. I bought some delicious homemade jams and pickled beets from an Amish woman. It was a rather chilly day so it felt good inside her cozy little shop. Enjoy your trip! Myself, I’ll be headed to Lancaster Co. this week. I would love to know more about the Amish in Galia County, Ohio! Gallia County is on the southeastern edge of Ohio right up against West Virginia. Pretty off the beaten track community of I think 4 church districts. Some if not most of them are from Wisconsin. 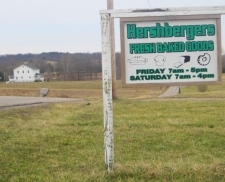 There are a few businesses including the Hershbergers bakery (was not open when I visited in Feb) and a variety store. This is hilly country, I was impressed by some of the hills that the Amish must climb in their vehicles. Yes, in fact two trips to Lancaster County in the next 6 weeks! Will be taking my grandchildren to ride the Strasburg Rail Road, a buggy ride and farm visit. My husband and I will go a few weeks later to celebrate our wedding anniversary at our favorite B&B. Not sure when, but will make a definite stop in St. Mary’s County, MD Amish country sometime this year. We go, EVERY Year, to Arthur IL. Partly for the Tri-County Auction, for buying in their stores/shops and to just mingle with the Amish. Nothing is more pleasing to my husband then to sit and watch the buggies, horses and people go by. The sound of the horses hooves on the pavement is music to his ears. This is our favorite place to visit. We’ll be visiting Union Grove, NC; Nathalie, Va.,(altho’ we’ll be out of the country for the field day/auction in May, unfortunately)the OO Mennonite community in the Shenandoah Valley; and hopefully the Muddy Pond Community in Tenn. to see their sorghum operation. Once again I’d like to invite y’all to Yanceyville, NC on May 19th for the Shenandoah Valley Chourus at 5 PM at the Caswell County Civic Center. They are young Mennonites from the Harrisonburg/Dayton area, and we’d love to have you come. Ahem, yes, that should read Shenandoah Valley “Chorus”, not “Chourus”…. We live about 30 miles from Burton & Middlefield Ohio & go motorcycling out in Geauga & Trumbull Counties during the summer and stop by some of the Amish establishments to Amish goods. In Middlefield Ohio, they have the best cheese coop that is predominately Amish. The cheese there is fresh and it is much cheaper & better than the “famous” Middlefield Swiss Cheese also in Middlefield. We always stop there for cheese & beef sticks. I also visit a few of my CSA (community supported agriculture) Amish farms every year when they have events there. Twice a month, they have farm visits.. 1 week-night just to walk around the farm/fields and 1 weekend afternoon event where they’ll have something like a corn-roast, a fall hay ride, canning demonstration, or some other sort of bbq or event. Its a lot of fun. We also enjoy a ride to Mesopotamia Ohio where there is a pretty neat store that is often our final destination on a days ride. http://www.endofthecommons.com/ Year before last, they remodeled and enlarged the store and its much more touristy now (unfortunately) but we still like to go there anyways. Business has been booming since they’ve expanded the store. Next weekend Geauga County has a Drive it Yourself Tour and several Amish establishments including one of our CSA farms are on the tour.. http://www.tourgeauga.com/system/media_libraries/library_0001/misc/2013-tour-list.pdf for the actual stops & http://www.tourgeauga.com/spring-drive-it-yourself-tour.aspx for more about it. I’d really love to go down to see Holmes County Ohio.. I’ve always wanted to go but havent. I’ll have to see if I can find someone to take a day trip with me. I live in the heart of the Holmes County Amish area but have never been to the Geauga Amish area, so I’d like to do that sometime! I’m curious if the “feel” of the area is same. Some parts here have become so touristy, I imagine that up there it is not quite as much, which is nice. We went to Jamesport, MO, last year and are heading there again this year near the beginning of June. Going to Bowling Green, MO, next weekend for their Amish Schools Auction. We’ve been putting off going to Holmes County for to long to visit family. I hope to make it this year. Planning to swing by Ethridge next week en route to visit friends in Tennessee.I find it very restorative to simply drive around and take in the scene (and photograph “discretely”, i.e. “sneakily”), and to stop and chat and buy a few things. Usually, the purchases are just an excuse to chat with these nice people. I have a little Louisiana present for my friendly buddy Danny Gingerich, which he expressed an interest in the last time I dropped by; love these cultural exchanges!I’m on the lookout for porch rockers and a long porch swing; if any one out there knows of any in Ethridge, please let me know. We will be going to visit some in Kentucky, Tennessee, and Missouri over the next weeks. When I was northeast of Riverton WY I noticed a sign that said something about an Amish communities in one of the small towns. I’ll see if I can pull it up later and tell you the place. There are also communities in CO and Oregon and Washington. I know in my county we actually have a Mennonite Church–actually not too far from home. I have no idea if they speak German or what. I’m thinking “progressive” (is that the right word? ), since everyone drives or commutes by bus where they need to go. Perhaps a call to them and see if they welcome visitors is in order. May not Amish but seems to me it’s not a bad replacement. We will be heading to Pinecraft Florida in June. We live on the East Coast of Florida and I want to see how they live there year round. We also are heading to Ohio, North of Columbus in July to visit family and I hope to stop at some settlements in Tennessee and Kentucky on the way. We have never visited an Amish settlement and we really are anticipating the adventure. Our problem is the expense of motels since we live on Social Security and a very small pension. Anyone know of inexpensive places to stay near or in these communities. We are not fancy, just need clean bed. Ohio is no problem as my family live 30 minutes from an Amish community. Yes, I figured their would not be as many but there will be less tourist too. I go to Holmes County quite often to stay with my Old Order Amish friends. I am Mennonite.I live in Asheville NC. Check airbnb, there is a nice place to stay called “Home in the Woods” on Arnold road, Kidron Ohio for less than $70 a night Host Mark & Jackie. Full furnished basement/walk out 2 bedroom-bath-kitchen. Also Cozy Corners ran by Aaron & Susan Fischer in Fredricksburg Ohio 606 Township road. They have a nice B&B for $65.00 a night, really nice people and place to stay. They are located across the street from another dear Old Order Friend of mine. Both of these places can be found on the internet. We have a Mennonite community/church here in Asheville Nc, also Taylorsville and Union Grove Nc. Their is an Mennonite community down in Sc where my son lives, Abbeyville, around 3 different districts. Old Order Friends in Wooster/Orrville/Fredricksburg area, its a beautiful place to see also Lehmans hardware store. OH yes, we hope to! We have a fall trip planned going from Florida to upstate New York, then on over to Indiana, so we’ll be passing through Pennsylvania, on the the way. We are hoping to hit some of the “districts” as we enter into those states. We do plan to stop overnight, so hope we can be near one of the districts, to be able to grab a meal from a good Amish restaurant, and to browse in a shop or two. We also love going through these areas, as it is like “coming home” or like one has stepped back into a quieter, gentler life — so peaceful, to gaze out over the beautiful country side, with the large farmhouses, and to watch the horse-drawn wagons in the fields, or the dairy cows grazing. We also in July, will be going camping in Ft. Myers, so we’ll make an effort to go to Pinecraft, FL, to stop in at Yoders for a good bite to eat, and shop at their market, too! Little different from the “countryside”, but still a nice place to visit! In March this year, my sister and I spent three days in Holmes County, Ohio. Plan to make a first-time visit to Pinecraft FL in late June when we go to Sarasota. Some time during the summer we will be going to Lancaster to see “Noah” at the Sight and Sound Theatre and also a few days up in the Finger Lakes of New York to visit family. Every October we go back to Holmes County. We love visiting Amish communities! Eric, oddly enough, R&C Construction out of Gallia County, Ohio put a roof on a rental house for me a few weeks ago. I never did meet them; I just mailed them a check. They are coming to my house next week to give me more estimates. Their accents are so distinct, though. They must be pretty liberal. They travel all around working. Not sure I will make it out of Illinois this year but I always have Arthur to go to and will be heading there soon. I don’t plan on going to an Amish community, but I had a brief encounter with a couple of Amish girls today that stunned me, and I’m curious if you might know anything about the community. I live near Madison, Wisconsin, and I’m aware that there are any number of very conservative Amish groups in the area. My daughter and I were in a rather well to-do mall in the city today where I saw a couple of plain girls, and I approached them (casually) in an accessory store where they were looking at sunglasses. I asked, in Penn Dutch if they spoke Dutch, but they gave me a surprised look, and I repeated the question in English, but they shook their heads and have me a slightly accented “Noo.” I asked if they lived in the area, and if they were a part of one of the local (yes), and if they were Mennonite–“No, Amish.” They were very quiet, and looked nervous and a bit reserved, so I wished them a good day and slipped away. All of the Amish I’ve met in the area speak the Dutch, so it was interesting. I’ve never seen any Amish dressed like these women (probably in their late teens, early 20s), which is why I assumed they might be of another plain community. Black, broadcloth skirts that covered even their shoes. They were closed with safety pins, it appeared (not uncommon, I know). But they both wore tailored, long-sleeved, button-up shirts(! ), one dark blue and one purple. Skirt and top, not dresses. No makeup, and a head-covering I had never seen. Regular cotton fabric with a broad band that covered the hair to the hairline, and a small tie opening at the base of the head along the neck in the back–enough of a small opening in the back to make it appear that these girls actually had cut hair, but had it ponytailed up a bit. No jewelry, but curves of bangs peeked out under one girl’s covering. I spend the rest of my visit at the mall trying to figure which Wisconsin community they had come from. Any guesses? Yet they said they were Amish — I wonder if maybe part of an “Amish Mennonite” group? Or maybe girls who were either leaving or debating leaving the Amish and had adopted some interesting clothing and hair styles? And NOT to say these girls were doing this, not at all, but I have read at least one blog in which the very Englisch writer — a young woman, I forget where — and a friend dressed in their best “faux-Amish” clothes, and went out shopping pretending to be Amish. So you just never know I guess! I am planning a trip to Holmes County, Ohio. Will visit Walnut Creek, Sugarcreek, Berlin, Millersburg, Charm and Mt. Hope. For me, there is nothing more peaceful than sitting on a rocker and watching the buggies and listening to the clip clop of the horses as they pass by. I plan to take a ride in a buggy while there!! No, I wish I where. Amish America is my Amish fix and mini vacation of the mind. One day I am going to the library and get on the system to put “The Amish” on hold and watch it some time this summer. Maybe I’ll watch “Witness” sometime too. I hope many people share lovely pictures of their “holiday snaps” with those of us here on Amish America who probably won’t be going to Amish Country. Hehe Slightly-handled-Order-man.. I loved that movie Witness.. course, anything with Harrison Ford is awesome in my opinion..
How would we share photos? Kim if you have something to share you’re welcome to send it in to me at ewesner@gmail.com. Since I mentioned planning on doing so, I placed a hold on “The Amish” and now the library website and my account notes that it’s “in transit” to a location nearer to me, I hope to get a phone call Friday about it. I looked several times over the winter and their copies where all being used a lot or had a long line up for holds. I am looking forward to viewing it. Just enjoy seeing the Amish working in and around their homes. Sampling the “goodies” is great, too. I would truly like to spend some time in an Amish community this year. After being too sick the last time I had planned to stay in an Amish-owned Bed & Breakfast, and losing about 2 years until I recovered, now, it appears the place I’d planned to stay closed ( it was part of their home, I believe, attached at one side, which they rented out and had turned into a B&B ). It is odd that it’s so important to me that it’s Amish-owned, I know; but, this is coming from me – someone who, now in her early 30’s, has wanted to not just observe, shop, or gawk lol, but to even just experience a small bit of Amish culture in this way. Ah, it’s so hard to explain, as I don’t romanticize the culture at all; I just want to perhaps see what it might be like. No whim is it, either — since I was 18 this has been a thought “percolating” in my mind. So I thank you, anyone, for your help, if there is a B&B or such! And I do hope you don’t yell at me for being the stereotypical one who doesn’t understand. I admit I don’t – I can’t, not having lived it. Farmstead Bed and Breakfast 1300 N 1000 W, Shipshewana, IN 46565 (260) 768-8086, is on an Amish farm. No electricity or air conditioning. This is not to be confused with the Farmstead Inn in Shipshewana which is a +200 room guest facility. If you want more info or if the phine number i gave you is not correct, let me know. As for which communities we will visit this year: Nappanee, Indiana; Holmes County, Ohio; Allen County, Indiana; Arthur, Illinois; St. Joseph County, Michigan; Elkhart – LaGrange County, Indiana; and maybe Adams County, Indiana. Thank you, to “Shipshe” and Linda! You can be pretty sure that whether Ive got back problems or not ( stupid discs! ) I’m going to be contacting one or more of these places — it’s something I have wanted to do since I was 17, and now, at 32? I almost feel as if this is something I need to do. And yes I know that sounds a bit — and probably is — selfish. Perhaps it’s something I want to do so much it simply feels like something I need to do! Now all I have to do is hope one of these places even has a vacancy sometime prior to summer of 2014 🙂 . Thanks again. I really appreciate your help — I expected not to receive any replies! lists Ramer’s Bed and Breakfast, phone 574-862-4775, on a Mennonite dairy farm in Indiana. Ky. for their annual spring consignment sale (April 13). I plan to visit Riceville, Iowa, Daviess County, In., Arthur,Ill. (for Horse Progress Days in early July), and Pearisburg, Va.
in Ky. (Pleasureville and Gravel Switch). I will be moving to Middlebury Idiana, this is the place I have been visiting for years, heart of Amish country, close to Shipshawana and Topeka, other great towns, I’m also glad to be by the Rise N Roll bakery for the out of this world doughnuts. Theirs so many neat places in the area I recommend looking up this town on the internet. Welcome to the community Garrett. Where do you currently live? We used to live in the metro St Louis area. In May 2008 we visited our first Amish community, which was Arthur, Illinois. We fell in love with the place and three months later were living there. Two years ago we moved out here to northern Indiana. We would have stayed in Arthur, but we moved here for work related reasons. It’s a great area here and I can relate to your feelings about the area. We rented in Goshen for a few months, but ultimately decided on living just south of shipshewana. There’s always something to do out here during the spring-fall, you will never be bored. The benefits in shipshewana are always worth going to (Haiti benefit, goldenrod benefit, habitat for humanity benefit). Also get a subscription to Die Blatt. It’s the local Amish newspaper. There’s a section of the paper that lists benefit auctions. These little benefit auctions for injured persons and schools are always worth going to. If you want subscription info, let me know. Pathway publishers on 250 W in LaGrange has some “learn Amish” primers. If you can speak the language you will be better off than I am. In Arthur English was used very frequently. Out here the Amish speak Dutch among themselves, so sometimes you feel like you are missing out. Above all just make yourself fit in and you will be accepted. How do I sign up to receive the blatt? The fellow Amish America reader “ShipshewanaIndiana” indicated in another location that they could help a person get the address for Die Blatt. Unfortunately they must have closed that response section down because I can’t reply to her. What she did indicate was that this was a newspaper that was used in Northern Indiana. So, I would suggest posting your question in the Indiana State area of Amish America. Well, I’m planning on visiting the Belle Center, Ohio Amish community. Wait a minute! I live in Belle Center, Ohio. I see my Amish son almost every day. And, at 90 1/2 I’ll just have to leave all the other Amish communities for you good folks to visit. I’m just not up to traveling anymore. My only reservation is how to rub shoulders with them without being patronizing. I can buy some canning goods and be on my way. I wish there was a bit more to do, but I guess they are mostly off limits. In my short period of time trying to get to know some Amish it’s a little hit/miss as to how to “rub shoulders” with them. Just like the English, there are some Amish that are willing to chat and some that are not big talkers. We English find them fascinating but this is just who they are and they probably don’t get the same thrill while talking to us. So, the trick is to meet as many as you can. The Amish person at the store might have time to chit chat with you or they might have to help other people. I was at a greenhouse today and it was slow and I spoke with an Amish woman for maybe 45 minutes. VERY friendly and helpful. On the other hand I hit a Amish “bent and dent” salvage store where they were polite but didn’t have time to talk, even if they would have wanted to. So, ask questions of those you run into, as to what other Amish business’s are around. Are there any social events coming up that they are raising money for their schools or such that you could attend. Many of us on here share your sense of wonderment at the way Amish live, keep trying to make inroads. It’s 2.95, it has over 500 of the most commonoly used words of the Amish language, also includes phrases, counting and telling time. I am planning to travel to Holmes County, Ohio and will be stopping in Walnut Creek. Is there an actual physical address where I can purchase this book or do you think I’ll find it in any of the stores that sell books? Thanks! Jamie I found the book on the Internet, I was looking for some info about the language and stumbled across it. Thanks Garrett. I’ll just send for it then…thanks for providing the address. Where in WNC are you? I live in north AL, but go to Etheridge quite a bit when I can. My daughter and her family used to live in WNC and I love to visit up there. I would be glad to meet you and show you around in Etheridge. Are you visiting an Amish Community in 2013? I love visiting at Etheridge, Tn. I would like to visit more places, but do not have funds for bed and breakfasts nor motels. I am thinking about the Mennonite Your Way as maybe to find places to stay. Have never visited Amish in Ohio, Indiana, or Illinois but I would love to! Has anyone stayed with families in the Mennonite Your Way book? I went to the Delano community yesterday. It was about 3 hours from Asheville mostly on hwy 74 through the Nantahala Gorge. The store was open and already had some produce and of course the requisite canned goods. I drove through the right of way and just felt pure delight at the site of those folks working their fields. It is a beautiful community. I hope they remain there that way for a long time, I’ll definitely go back soon. I felt a little guilty cruising on their dirt road beyond the store, so next time I’ll leave the way I came. We were on our way home yesterday from Gatlinburg yesterday and went by the Delano community, also! I wonder if we were there at the same time? We didn’t go past the store, but we did go right after we crossed under the train bridge. We didn’t go far though. I had never heard of Delano until I read it a couple of days ago and we were hoping to see it on our way home. Yes, there was some produce, but not a lot. There were some plants to buy, we didn’t buy any of those but did buy a gourd. I think I was in the store around 2:30-3. I was by myself in black pants and driving a white Toyota. If you had went on a bit after turning right you would have gone to to the second entrance where they have their outbuildings for sale. The fields are parallel to Delano rd, but with train track and tree line, you can’t see much. Continuing past the the outbuildings area, there is a big strawberry field. We were there just a bit earlier than you, but not much. We did not get to drive around much in the area as we were in a rental car and had to get back in time to get it turned in. Now I know where Delano is though. I did take a picture of the sign on the market and also a picture of the barn and fields near the market. I just confirmed the dates and will be going to Lancaster over the Memorial Day weekend. I will be there Saturday and Sunday and I’m really looking forward to it. I even plan on making a stop in the “Amish Stuff” store on Lincoln Highway that there was a post about several weeks ago. Im slihgtly dissapointed that I could not stay longer and Sunday to me is not one of the better days to go but either way Im sure it will be a good trip. I looked at the Mud Sale schedule and there does not seem to be one scheduled for that weekend which is unfortunate but since I live in Md. only an hour or so away Im sure I will be going back other times through the summer. I plan to stop at some of my usual places and will be sure to get my Shoo Fly pie to bring home. I never take a camera with me because I always forget until Im there. This time I plan to take a camera and hopefully will be able to get some decent pictures. Of course I will be respectful of the Amish and there beliefs about photographs and plan on just taking some scenic photos. Eric, If I get any decent pictures how am I able to share them with this group? Tom feel free to send them along to me at ewesner@gmail.com and we’ll see if we can share some here. Does anyone know if the book that Garrett is refering to called “The Amish Language For The English” by Steve Troyer & Dan Swartzentruber? Eric, Thank you for the email address if I get any good pictures I will send them along. Is this the one Garret? I wet to Middleburry Indiana on Saturday went to look for apts. and had to stop at Rise n Roll bakery talked with my Amish freinds in their.I can’t wait to be an offical resident. Garrett, Thanks I wanted to make sure that was the one you were talking about. I downloaded it on my Kindle Fire a bout a month ago. I didnt know if there was another one out there to look into. I found these 2 while looking online “How to speak Dutchified English” by Gary Gates & “Quaint Idioms & Expressions of the PA Germans” by A. Monroe Aurand, Jr.. These are both available at the Lancaster Mennonite Historical Society. Most of the books they have are listed on their website. I will also be making a stop there while in Lancaster over the Memorial Day weekend. I’ll shorten up a long story..but my husband and I purchased land from a Amish guy in a Amish Community. We cleared and cleaned it for two years getting to know the Amish families who lived next to the property. We spent holidays with them, had cook outs, hired the kids to help us etc. They somehow lost their 6yr old home to predatory lending and we were all heartbroken. My husband drove the moving van to move them to their new home in Middlefield Ohio. The Amish house sat empty for a year. We ended up purchasing it on an online auction. It took 6months of work to “Yank” it over. Add electric, heating ducts etc. When we had carpenters in to try and figure out how to put in a dishwasher, stove, fridge.. they were all blown away by our cabinets throughout the house.. they all said our kitchen cabinets would cost over $90,000 to have built. Lucky for us, the kitchen is so huge (over 1200sq ft) that we could just have an island built and that solved alot of problems. The Amish are just like you and I. There are good and bad. Our neighbor and the Father of the family that used to live here are hysterically funny.. could litterally be comedians! Sara, there are more than a few B&B’s around us that are in the hub of the 4th largest Amish community in the country. I’d suggest staying in one of them, and just visit an Amish family. But one word of advice.. I don’t know why they are called “simple”.. we lived just like Amish for 6mths before our contractor could start our construction. There isn’t one thing “simple” about being Amish. It’s alot of hard work! That is why they have so many kids.. to help 🙂 You don’t just turn on a spigot for hot water.. you have to cut, stack, bring in the wood for the fire.. Start the fire. Turn on the generator to run the air-compressor to fill the airtank to fill the water tank of the hotwater heater. Wait for the water to heat via the fire.. (and while your doing that you can clean horse stalls, feed the chickens, gather eggs,sweep the porch and get 4 kids dressed for school).. THEN you can take a shower. (I’m not kidding.. that’s what it’s like.)! Cook breakfast for 16ppl, do dishes, start cleaning. Imagine doing laundry for 16ppl with our modern washer and dryers.. NOW imagine doing it with an old wringer washer (don’t forget to add more wood to the water heater fire and air back up the airtank)! Their children are the most well behaved I’ve ever known. It’s because they don’t have time to get into trouble.. they have way to much work to do. Our 25yr old Amish neighbor (who’s husband is so funny).. bought us a book for Christmas a few years ago.. “1001 Questions and Answers on the Christian Life” by Pathway Publishers. I’m sure she bought it at her Uncle Gideon Hershburgers housewares store. It will answer any question you have about the Amish. We refer to it still. My favorite thing about the Amish is their donuts! We live in the heart of Maple country, and the Maple creamsticks are to die for! Have fun finding out about the Amish! Hi, im Lucia from Argentina. I am going to Washington next week for holidays. I am writing with some friends a note about Amish communities for college work, so i want to visit an amish community for a day to live the experience and collect information. During my trip my friends will be visiting a Mennonite community in La Pampa, Argentina. We would like to compare the differences in each country. So, you can visit the Amish community in Maryland without hiring a tour before? or you should go with a local guide? Also I would like, if not ask for much, ask you some questions about your experience and use you as a source for college work. Leave a reply to Are you visiting an Amish community this year?